1. Email compliance prospective student-athlete request form. 3. Receive a copy of the finalized document electronically. Electronic signing can result in an annual savings of approximately $25,000 - $30,000 in express mail, copies, and personnel time. As a result the processing time and budget could be cut by 80%. According to the federal E-SIGN Act of 2000 electronic signatures are equivalent to a written signature. The documents are password protected. Coaches and Athletic Administrators will no longer have to wait for a fax or for the express mail to arrive. Instant details regarding the acceptance of prospective student-athletes will be available to institution administrators as well as coaches. Institution’s Athletic Administrators are provided with a complete data summary of prospective student-athletes offers as well as acceptance. Administrators are also able to itemize data by sport teams. Go green! There is no longer a need to make multiple copies to be sent to various parties. 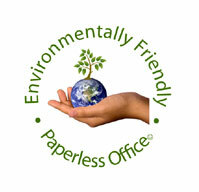 Decrease your carbon footprint by no longer using express mail.